Daily care for treating oily skin and young skin blemishes, acne prone. 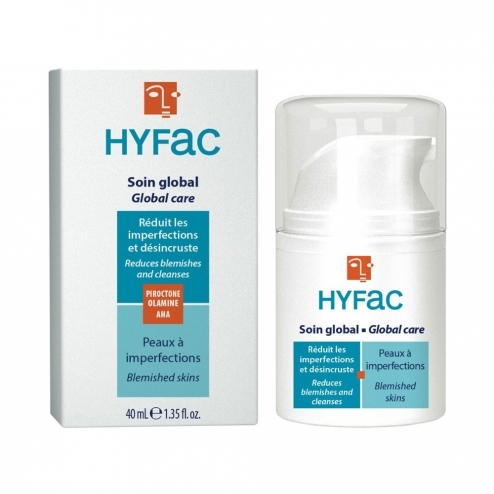 Keratolytic cream facial, AHA (alpha-hydroxy acids), in emollient and keratolytic, to purify the skin and remove skin imperfections, while moisturizing the skin and absorbing excess sebum. The skin regains its physiological equilibrium. Use morning and evening, preferably before applying local acne treatments. It is recommended to avoid eye and lip contour. Aqua, C12-13 alkyl DI malate, glycolic acid, cetearyl octanoate, cyclomethicone, glycerin, steareth-21, steareth-2, serine, pentaerythrityl stearate / caprate / caprylate adipate, nylon-12, cyclomethicone, polyacrylamide, cetyl alcohol, sodium hydroxide , C13-14 isoparaffin, diazolidinyl urea, piroctone olamine, fragrance, dimethiconol, laureth-7, xanthan gum. Suitable as a makeup base. Non-comedogenic. Hypoallergenic.